In July, Marge Perry, Senior Registered PCA in Janney’s Ft. Lauderdale, Florida branch, was presented with the 2018 Janney Values Recognition Award. This is the sixth year that Janney awarded this honor to a team member who has made a positive impact on the firm. Marge is a dedicated PCA, branch technology leader, on-boarding expert, and branch syndicate coordinator, who has proven herself as a deserving recipient. As a testament to her hard work and dedication to Janney and her branch, Marge has been nominated by her team for the Values Award every year since the program’s inception in 2013. Marge joined Janney as part of a team of two Financial Advisors from Morgan Stanley. She has been appreciative of Janney’s culture and the support that she has received from day one. “Janney is great because it’s small enough of a firm that I know a lot of people and have an opportunity to talk to a variety of people on a daily basis. It’s also a big enough firm that we have the resources to manage high net worth clients and exceed their expectations,” said Marge. In her 13-year tenure, Marge has witnessed her branch go through many changes and she is excited that it is growing. In the past year, the Ft. Lauderdale branch has recruited three new Financial Advisors, who have brought nearly $200 million in assets under management to the firm. Marge was taken aback and shocked when her name was announced as the 2018 Values Award recipient at the Leaders Meeting held on July 26. Her branch manager asked her to travel to Janney’s corporate headquarters in Philadelphia for a Project Dynamite meeting, so she was happily surprised by the exciting turn of events! Outside of Janney, Marge keeps busy by managing a women’s soccer team for the past six years. Her team, FC Surge, plays through The Women's Premier Soccer League (WPSL), an independent national league whose main focus is on the development of highly competitive premier women's soccer. Although Marge isn’t a soccer player, her three children have all played. Today, her daughter April (28), plays as part of Marge’s team. Last year, the team placed second in the regional championships for the south Florida region. 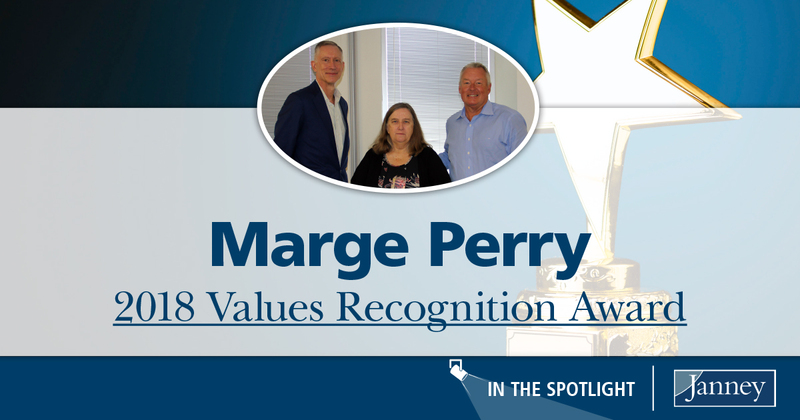 Congratulations, Marge for being named the 2018 Values Recognition Award! Thank you for all that you do for Janney and for keeping people at the center.